As always, I’ve been buying and trying a variety of new products in my never-ending quest to find the one: the one makeup that will perfectly match my skin tone while hydrating, keeping shine at bay and hiding every blemish; the one hair product that will turn my locks to frizzless, voluminous, shiny silk; the one lip gloss that will flatter my face, plump my pout and protect against the elements while remaining totally kissable. While I’m still searching for all of these wonder-products, I have discovered a few fabulous finds lately that I thought I’d share. Best yet, each of these costs less than $10 and can be picked up at your local drugstore. Treat yourself – you may just find your one. Aussie 3 Minute Miracle: This miracle worker has been around for ages but somehow I hadn’t tried it until a few weeks ago. One use and I’m hooked – this deep conditioning treatment really conditions hair, leaving strands detangled and super soft and my scalp flake-free. My hair was shiny and bouncy, never oily, and my hair retained its smo oth, frizz-free appearance for days. Use this at least once a week to give your hair some TLC, especially while we are still dealing with cold outside temperatures and drying indoor heat. Rimmel London Lash Accelerator Mascara: This is a quality mascara, plain and simple. It is supposed to create fuller lashes with regular use, and while the change isn’t drastic I do think I’m sporting a thicker fringe these days. This mascara stays put all day and doesn’t irritate my ultra-sensitive eyes. If you are looking for a good, inexpensive mascara, this one’s for you. Simple Cleansing Facial Wipes: You’ve probably seen the commercials touting Simple as Britain’s top skin care brand – I’ve seen them tons of times. 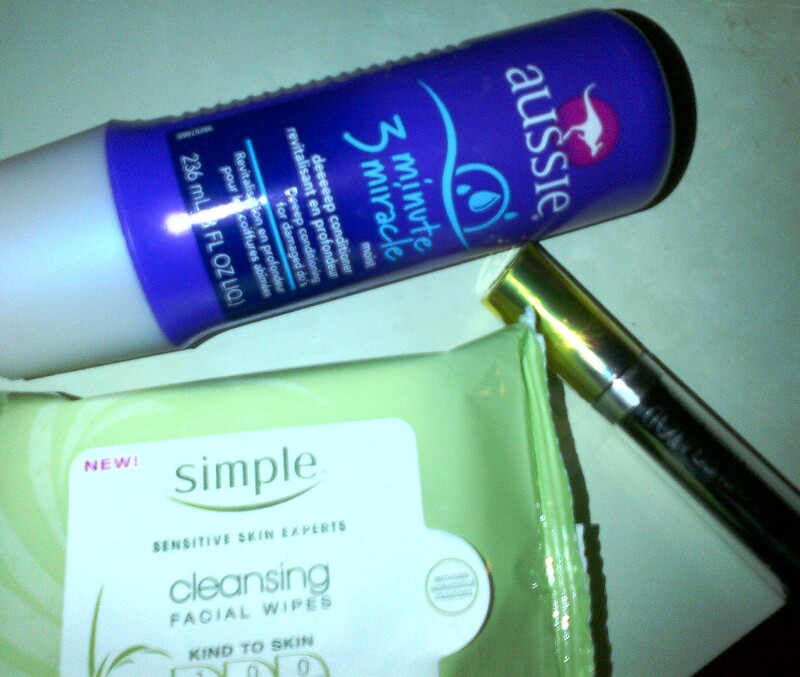 Intrigued, I decided to give these cleansing wipes a try. They have quickly become a regular part of my skin care routine. I am frequently too lazy to properly wash my face at night, and these wipes remove all traces of makeup and grime without over-drying my skin. They are formulated for sensitive skin and are fragrance-free. I recommend stashing a pack of these in your gym bag and your bedside table, or any other place you’re likely to want to freshen up.